This morning I heard a story on NPR about this guy who realized that he was living a very comfortable, happy life but that one day he realized that his whole life was being lived in a bubble, so he decided that he was going to break out of the bubble by attending randomly selected, open to the public events in his city. It was an inspiring story about breaking out of your comfort zone and trying new things. He talked about how uncomfortable it could be at moments and how there were times when he was tempted to turn around and walk away, but he didn’t, and the outcomes were wonderful. As I listened to his story, I couldn’t help but challenge myself to think carefully about ways in which I do and do not venture outside of my own bubble. In some ways I am an adventurous person, but in others I’m not, and I hope that hearing this story will push me to start exploring some other worlds, even ones that are close by. 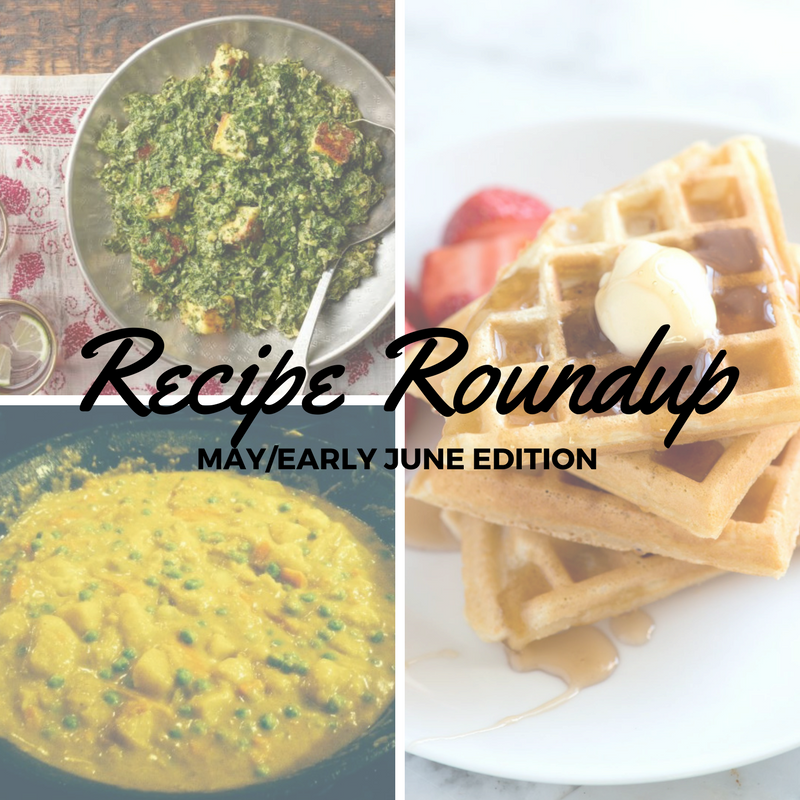 If taking a step outside of your comfort zone sometimes involves cooking, then I’ve got some great recipes for you in this Recipe Roundup! 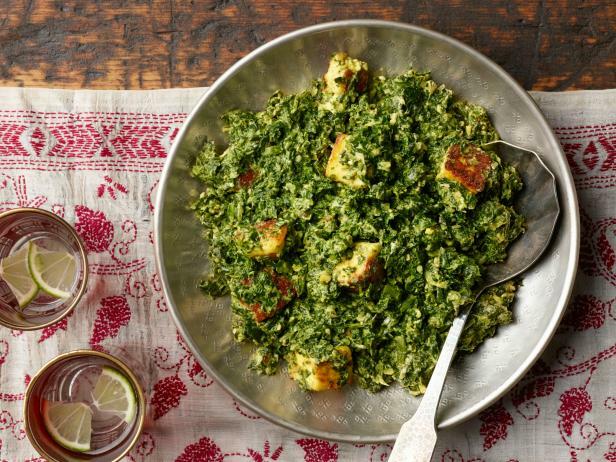 The first two recipes in the Roundup came about because one of my clients gave me some homemade goat milk paneer (Indian cheese) and since Saag Paneer is one of my all-time favorite dishes, I jumped at the chance to make it for the first time, so an Indian dinner was in the cards. 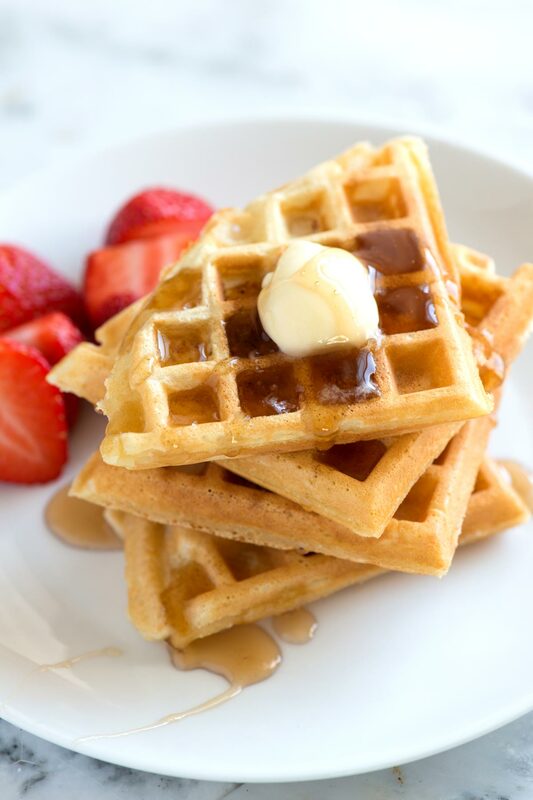 The waffle recipe is a game changer if you are a fan of waffles that are crispy on the outside and light and fluffy on the inside. And the Southwestern Spinach and Black Bean Dip is likely to become a go-to in our house. Are you ready to step out of your bubble and try a new recipe? Saag Paneer: Spinach with Indian Cheese after poking around online for a while I settled on this recipe because it seemed to be the most manageable. Instead of using frozen spinach I used spinach from my farm share, I used coconut oil instead of vegetable oil, and I skipped the chili pepper in the hopes that my boys would be more open to eating it. Other than those modifications, I followed the recipe closely and the outcome was AMAZING. I could have eaten it for a week straight. My boys still weren’t convinced, but did eat the little bit that they each had on their plate, and my husband loved it almost as much as I did. Make again? Absolutely and soon!! 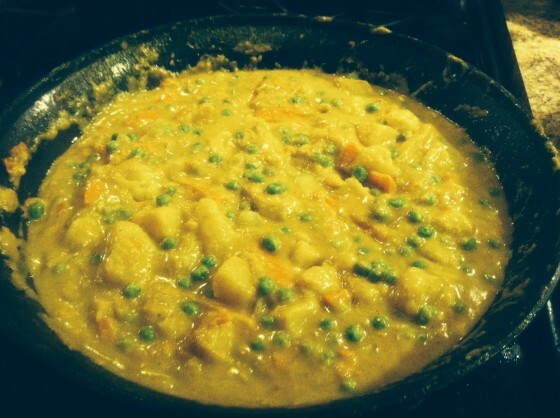 Potato Curry with Peas and Carrots I made this to accompany the Saag Paneer because I was confident that my boys would enjoy it, and I was right. I found the directions on this recipe to be a little vague for my taste, but I have made enough curries that I could figure it out. It did take longer than I had anticipated, but the flavors were fantastic and it was relatively simple to make. Best Homemade Waffle Recipe I stumbled upon this recipe last weekend as I was trying to find a waffle recipe that only required one egg. The secret ingredient in this recipe is cornstarch and I have to say that I am a convert! I made this recipe using spelt flour instead of all purpose flour, to add some whole grain heft, and they were still light and fluffy on the inside and crispy on the outside. All four of us LOVED these waffles. Two quick notes: 1) the batter is much runnier than any other waffle batter I have ever made and seemed to require more batter per waffle, so be prepared and 2) I will never make a single batch of this recipe again. Even for my family of four, this recipe was barely enough for breakfast and I guarantee you will want leftovers for the freezer. Make again? Yes! This is going to be my new go-to waffle recipe! Southwestern Spinach Black Bean Dip I made this to take as a side dish to a taco night at a friend’s house. Instead of canned corn I used frozen and I added a bunch more spice, but other than that I followed the recipe. It was delicious, filling, and packed with spinach. It also makes a TON! We gorged on it and there was still a lot leftover, which I then mixed with some leftover chicken to make a variation on my baked chimichangas, which were the biggest hit of the week in my house. Make again? Definitely and definitely will turn the leftovers into baked chimichangas again, too!